Have you met Judi from Green Fairy Quilts? Judi lives just about an hour away from me and has quilted many of my quilts--her work is absolutely gorgeous! She is as nice as can be and has an adorable family; Green Fairy Quilts is a family business Judi runs with her husband. Judi is offering this gorgeous Fat Eighth bundle of Meadow by Blackbird Designs for Moda to one of my blog readers! First, just leave a comment on this post. Second, become a follower of Judi's blog, then come back to leave a comment letting me know. Third, sign up for the Green Fairy Quilts newsletter! I'll keep this giveaway open through the weekend! Thanks so much for stopping by! I love this fabric for the giveaway....and love to order from Green Fairy Quilts. They always have great prices on pre-cuts. I already subscribe to her newsletter! Thanks for the chance to win some pretty fabric. YAY! What gorgeous fabric! Thanks so much for having this giveaway! Good luck everyone! I also already receive the newsletter. Thanks to Judi for offering this prize! I'm a new follower. thanks for the chance to win this fabric. I also registered for the newsletter. Love the fabrics I order from Green Fairy & the prices! Wow, what a gorgeous stack of fabric! Thanks for the chance to win! Hi, I've done all three. Fantastic, beautiful prize Judi! I already follow Judi's blog. She has super skills -- her quilting is fantabulous! I have been a follower of Judi's blog for awhile. Oh yes, and I already get the newsletter. I have even purchased fabric from Green Fairy Quilts in the past! The fabrics are gorgeous - another Blackbird winner. I also have been subscribed to her newsletter. It's a great way to get notified of sales and special offers. Thanks to Judi for the fabric giveaway! I'm trying to follow Judi's blog and for some reason I can't.. The fabrics are so pretty! Judi's quilts are to die for! She does such amazing work, I love to just sit and look at the pictures of her quilts. Thanks for the giveaway. What a yummy stack of fabric! And I have been a follower of Judi's blog for a long time now! Thanks for the chance to win! What a lovely selection of fabrics! Thank you for hosting this giveaway. I've been following Judi's blog for awhile...she does such amazing quilting. I'm already a follower of Green Fairy Quilts, Judi's longarm quilting is awe inspiring. I've signed up fro Judi's newsletter. Thank you for the chance in the drawing. I am a follower of Judy's blog and I sign up for her newsletter. Ooooo, what a timeless and versatile bundle! I can think of oodles of projects for this stuff! Generous giveaway! What gorgeous fabric! Thanks so much for having this giveaway! I've already signed up for Judi's newsletter. I already follow Green Fairy Quilts' blog. Gorgeous fabrics! Thank you for the chance to enter such a great giveaway. Off to sign up for the newsletter and join the blog too. I am now a follower of the blog, and have signed up for the newsletter. Exciting giveaway! Thank you for hosting it! I receive Green Fairy's email newsletter. Ya me hice seguidora de tu blog, gracias por la oportunidad de participar. Saludos. Pretty fabric! I am a follower on your blog!! Awesome fabric!! Thank you for the chance to win! I have my fingers crossed!!! And now I have signed up for the Green Fairy newsletter. And I have signed up for her newsletter. I am a follower already :) Thanks for such a great giveaway! I am a newsletter receiver-er :) Such awesome fabric - thans for the chance to win a giveaway!! Those materials are super and my brain is working overtime thinking how I would use them ... if I was lucky enough to win them! These fabrics are gorgeous! Thanks for the chance to own them. I'm already a follower and receive her newsletter. Oh what fabulous colours in that fabric! Thanks for the chance to win. have signed up for the newseltter - cant wait! sou uma admiradora do seu trabalho e do seu blog! That's a gorgeous bundle! Thanks to you and Judi for the giveaway! I am a follower of Judi's blog. já me habilitei para ser seguidora ( follows). I love ordering precuts from Judi. Her service is so fast too. I follow Green Fairy Quilts. I get the Green Fairy Quilts newsletter. What a nice giveaway. Judi's prices are so fabulous on precuts--I have WAY to many in my stash now. Love her patterns as well. I am now a follower of Judi's blog. Would love to win this--thanks for the chance! woohoo! I crave fabric to quilt with! Thank you for the giveaway! I follow Judi's blog! Thanks for the chance to win! What a lovely FQ bundle! I also already get their newsletter. Thank you for the chance to win this beautiful fabric! Love the name green fairy quilts. I can just picture a little fairy happily sewing away! I signed up for the Green Fairy newsletter! I already receive her newsletter. Oooh, I love Blackbird Designs! What a fantastic giveaway. I'm a follower of this fantastic blog. I also signed up for newsletters. What a lovely bundle. Thanks for this give away. Love GFQs! Great prices and super fast service. I'm definitely a follower of Judi's blog. I love seeing her quilting photos! Hello! I am a crafter Brazilian and follow their work, they are beautiful! They are an inspiration to me! Can I participate in this lottery? I'd love to! I'm following Judi's blog and I have signed up to receive an newsletter of the Green Fairy Quilts! Hi, I love Judi's work I aspire to be like her. I love a second chance. Haha! I went and signed to follow Judi's blog. Please enter me to win these beautiful fabrics just love them! Thank you to Sherri and Judi for offering this giveaway. Thanks for the chance to win. I already get the Green fairy newsletter! Wonderful bundle and I would love to win. Oh yes I know Judi and I follow her blog. Oh my gosh I love Blackbird Designs! It's one of the lines of fabric that I never seen in fabric stores and always have to order online. What a terrific giveaway and I'm already inspired to think what I might make with it! I would be very happy to win this fabrics, thanks for the chance. I love Meadow! Blackbird Designs fabrics always catch my eye. I follow Judi at Green Fairy. Her quilting skills are stellar! I do get Judi's newsletter and love reading it. Happy quilting. I am now a follower of Green Fairy's blog. I now receive the newsletter! I am a new follower of her blog! I am now signed up for her newsletter! Judi at Green Fairy does amazing work. Thanks for the giveaway. I am a follower of her blog. Beautiful bundle of fabric! Thanks so much! Already a follower of her blog! Alredy signed for her newsletter ^__^ Love her shop!!!! I've been following Green Fairy blog for a little while now. Fantastic fabrics!! Would love to win. Thanks for the chance. Such a lovely bundle of fabric. I would love to enter. How lucky are you - Judi's work is incredible. Someday I would love to have something quilted by her. I also am already signed up for the newsletter - thanks for the giveaway. How lovely! Will be following and signing for the news letter. I'm new to this blogging thing! pretty fabrics. Thanks for the giveaway. I'd love to be the lucky winner! Oh, this is so lovely! Thanks so much! I am already a follower of her blog! And I already get her newsletter! I'm following Green Fairy Quilts on Reader. Also have ordered from Judi and was very pleased with the whole transaction. That's a lovely assortment of fabrics! Thanks for the chance to win. Signed up for the Newsletter. Thanks for the chances to win! I follow Judy's blog. Her quilting amazes me. I do follow Judi's blog. Lovely fabrics...thanks for such a great giveaway. I love the fabric! 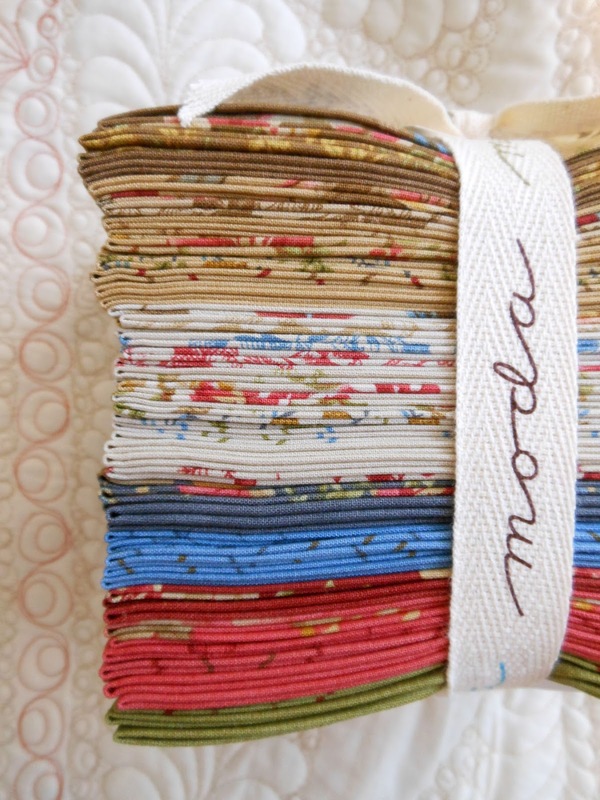 I'm already a follower of Judy's and I receive her newsletter so hope I qualify for a chance to win the fabric bundle. I became a follower...her work is gorgeous. Thanks for offering a wonderful giveaway. The fabric looks wonderful. I have also signed up for the newsletter. Beautiful fabric! Love the Green Fairy store! I am a happy follower of Judi's blog - love to see her quilting! LOVE IT! Thanks for the offer!!! I receive the Green Fairy newsletter - love to see it hit my inbox! I love Judi's blog, I already follow it. Subscribed to the newsletter, thanks! Those fabrics are wonderful & I would love to win - thanks!!! I am a follower of Judi's blog - love it!!! I receive the Green Fairy newsletter - love it also!!! I love Green Fairy Quilts!!! BEAUTIFUL!! Is there anything more I have to say! :) great giveaway! What a sweet bundle.There could be some serious play time with those fabrics. I already get her newsletter!! I love quilts. I'm a wife and a mom to 4. I design fabric for Moda. Quilter. Maker. Designer. Writer. Homemaker.